Conference season is upon us and many campaigners will be packing their bags to head off to Birmingham, Liverpool and Manchester. But as Chloe Stables notes in an excellent post about making the most of attending conference they can be ‘expensive, hectic and occasionally frustrating‘ but other options for engaging with MPs do exist. Back in March, I was involved in organising an event to mark World Water Day, which at the time one colleague musedwas a better use of resources that organising an fringe meeting at Party Conference. A modest objective of getting 12-15 MPs along was set but in the end we got over 40 MPs came to join in, a great success and far more than we would have got attending a fringe event at conference. The idea was simple. 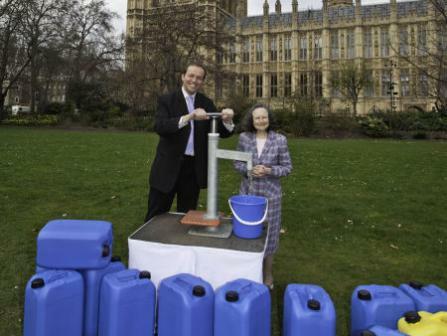 Invite MPs to join us on and walk 100m with a jerry can on a course we’d set up in Victoria Tower Gardens, it was a symbolic act to remember the fact that many people have to walk up to 6km to get access to something we expect to get from our taps, and we hoped that it would help to build links with Parliamentarians who could act as champions for the issue in the coming year. You can read more about the event here, but it got me thinking about what some of the elements that made the event a success. Perhaps they’re nothing new but I wanted to share them to see what insight others have about what works when looking to engage MPs in events in Parliament. 1. Provide a photo opportunity – It’s a cliché but the offer of a photo and a pre-prepared press release undoubtedly encouraged some MPs to join us. We set up a water pump and promised to get the release to them within 3 hours. It was nice to use this as a way of helping the MP demonstrate the interest they had in the issue. 2. Targeted the few not the many – The decision was taken early in the planning not to actively invite all MPs, but to identify and approach a smaller number of influential MPs on the topic, for example those on key select committees or those who’d shown an interest in the issue previously. We hoped that our invitation was more likely to get noticed, and we already had a relationship with some which made it easier to follow up with. 3. Followed up via Twitter – Ahead of the event, we got in touch with those MPs who used twitter to remind them to come down. At least one mentioned that this had made the difference about them attending or not. 4. Used our supporters – We invited our supporters who lived in the constituencies of MPs we had an interest in to attend, but had realistic expectations about the number who’d be able to join us on a Tuesday. We also encouraged them to get in touch and invite their MP along anyhow. Again, a number of MPs mentioned that this was one of the reasons they joined us. 5. Made the most of our contacts – We found that amongst an extended group of colleagues had a number had contact with friends who worked for MPs or who could raise the profile of the event inside Parliament. A few well placed e-mails and calls from them certainly helped to increase the numbers attending. A reminder that sometimes it’s useful to use your personal contacts. 6. Kept the event going for two hours – Allowing MPs a longer window of time to come along seemed to yield dividends in reducing the number of MPs who simply couldn’t join us because of diary clashes. What successful events have you organised with MPs? Is Conference a useful forum to engage with MPs? What have you found works and what hasn’t? Some of this post originally appeared on the NCVO Campaigning Forum.